I was recently contacted by Harper + Ari to see if I wanted to try out their exfoliating sugar cubes and obvs I agreed because LOOK AT THEM! They look good enough to eat and also I love the idea of just taking one cube into the shower because if your shower is anything like mine then you have limited shelving space available. I chose the peach scent and I am so happy I did, its so fresh and sweet but also the peachy color of the cubes is totally instagramable don't you think? Ive used the cubes twice now and one sugar cube is definitely enough for full body and then some. Which makes me think I've been using way too much of my other exfoliating products. To use you simply break the cube up in your hands with warm water first and then massage over skin. The first time I used this I didn't break the cube up first and used as is, it still did a pretty good job but breaking it up gives you more control and exfoliates a lot better. As I said earlier I love the idea pf just taking one cube into the shower or bath with me instead of having another product to find space for in my tiny shower. The one thing I will say is that I did find it a little difficult to get a sugar cube out when I first opened the glass container... I'm sure once I've used few more it will be a lot easier, its just something I noticed. I love using gritty exfoliating sugar based products and I wasn't disappointed by Harper + Ari, my skin felt extremely soft and left the perfect base for my moisturizers. The scent is lovely too and I can only imagine how good the other scents smell. 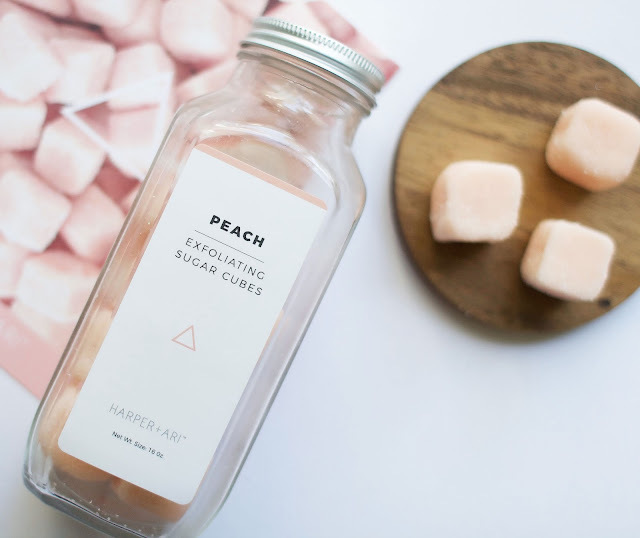 Have you tried Harper + Ari exfoliating cubes before?